State PSSA and Keystone results show more School District of Philadelphia students from elementary through high school are achieving – especially in the area of literacy. On October 3, 2017, Superintendent Dr. William R. Hite lead a pep rally celebration with students, teachers, staff and elected officials at the Morton McMichael School. The pep rally was to celebrate the steady—and, in some areas, significant—gains in student academic performance announced last week by the District in its 2016-2017 Pennsylvania System of School Assessment (PSSA) and Keystone exam results. 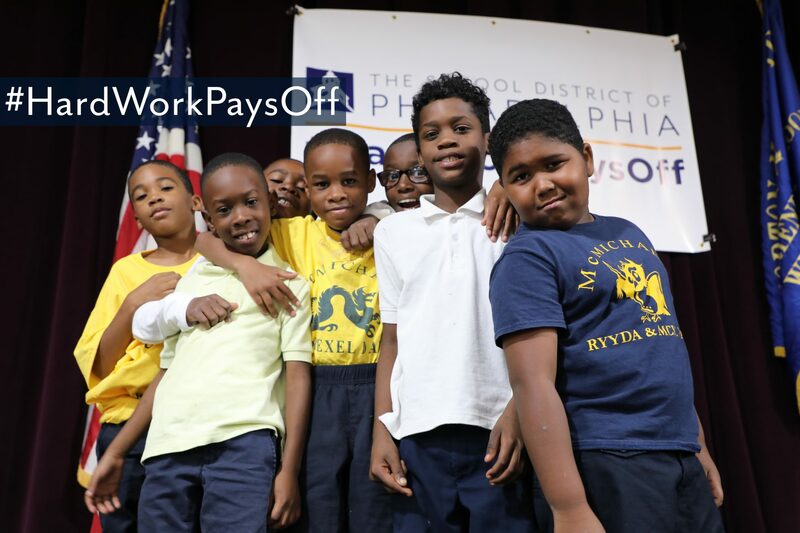 Morton McMichael, a K-8 school in West Philly’s Mantua neighborhood, was selected because it is representative of the many schools across the District showing notable gains in PSSA achievement, particularly in reading. Schoolwide, McMichael saw a 7 %-pt increase in the percent of students reading at proficient/advanced levels (grades 3-8) in 2016-2017 PSSA scores compared to the year before. Last year’s McMichael 3rd graders showed large gains with a 16 %-pt increase at proficient/advanced, a 12 %-pt increase in those students scoring at advanced, and an 18 % point decrease in those students reading at the lowest reading level. 3rd and 4th grade also saw the largest gains in math with 3rd graders seeing an 11% point increase at proficient/advanced levels and 4th grade with a 15% increase. “These results don’t come easy and we are proud that our hard work is paying off. More of our students are reading on grade level, and our math scores are up. These results are the product of a focus plan and dedicated students, amazing teachers, and a great school community,” said Morton McMichael Principal Brian Wallace said. The PSSA/Keystone data released last week show positive news about Philadelphia’s public school students, with perhaps none more significant than the PSSA results in reading skills. S tudents at every grade level from 3rd through 7th showed improvements in reading (ELA). Results show that more District students are reading at proficient/advanced rates, more students are reading at the highest level, and fewer students are reading at the lowest level. A mong third-graders, the number of students scoring at ‘ proficient’ or ‘advanced’ levels increased by five full percentage points.